After much recognition for Original Sensible's Gorilla Glue #4, in particular for the crazy resin production, Original Sensible have combined GG#4 with the equally acclaimed Zkittlez to create the all new Zkittzy Gorilla! A sticky hybrid that has the sweetest, tropical mouthwatering fruity flavours with a hint of chocolate that will dance tango on your taste buds. Zkittzy Gorilla feminised cannabis seeds offer the most potent smoke with THC levels in excess of 22% but the extreme potency has a well balanced effect between mind and body being both relaxing and offering cerebral stimulation. 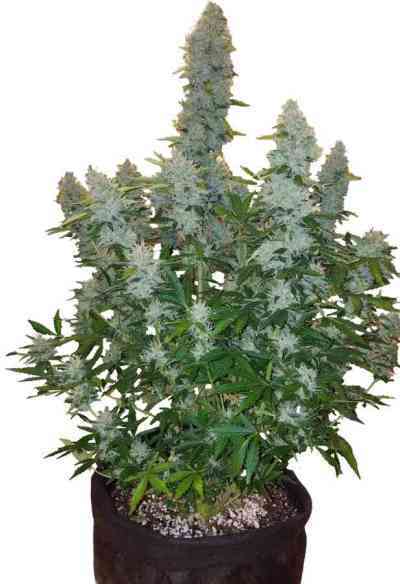 Growing Zkittzy Gorilla marijuana is a breeze, even a novice grower will be able to produce awesome results. Thick dense colas layered with syrupy resin full of indica power ready in a flowering time of under 65 days. For the more experienced grower Scrog training is well suited producing average yields indoors of around 600 gr m2. Take Zkittzy Gorilla outdoors and you will produce a stocky bushy plant that´s well controllable and easy to manage and harvests an abundance of succulent syrupy buds around end September, early October. For those who like their weed with maximum resin with an amazing relaxed happy and uplifting sensation save some space in your grow room for Zkittzy Gorilla cannabis seeds from Original Sensible Seeds.